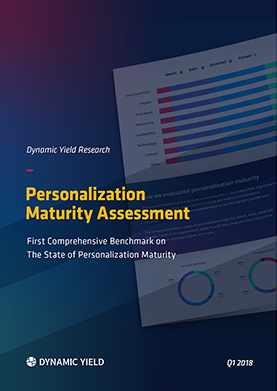 To understand the current state of personalization maturity, Dynamic Yield surveyed 700 marketers and executives from cross-functional roles at various industries in Americas, EMEA, and APAC to better understand the degree to which companies feel as though they are personalizing experiences for customers. Measured against eight signals of personalization, organizations were ranked and benchmarked according to four levels of personalization: absent, basic, advanced, and pioneer. 76% of marketers in North America rate their “customer-centricity” as either basic or absent. In North America, 30% of marketers claim to have no processes whatsoever for personalization and 26% have zero personalization technology. Globally, 92.43% of marketers believe there’s value in personalization. Only 7.57% are disinterested in the idea or don’t believe in the value. In AMER, 95.81% of marketers believe there’s value in personalization. Compared to 91.84% in APAC, and 90.79% in EMEA. Half of the companies worldwide (49%) have already identified personalization as a top priority investment. Get your free copy of this research by filling out the form.